First snow plow of the day … there surely will be many more. Winter Storm Stella is here. The Governor has declared a State of Emergency meaning a statewide travel ban is in effect. Region 4 Schools, Essex, Chester and Deep River Schools, Town Halls and Libraries, and many businesses from the size of Pfizer, Inc. downwards are closed. Events galore have been cancelled and a parking ban is in effect on all town roads in Essex from 7 a.m. to 11 p.m. today. In the event of a real emergency, call 911. State and local officials urge residents to stay off the roads during the storm … and stay safe. 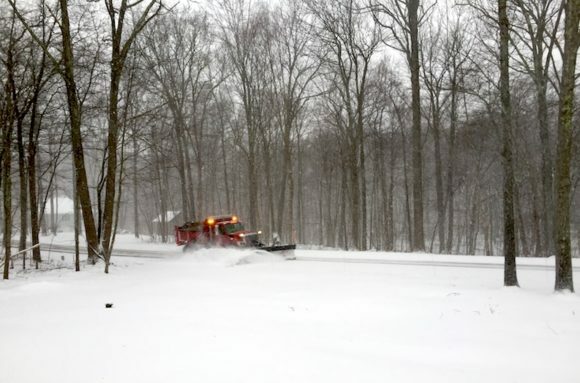 Latest weather reports, however, predict Southeastern Connecticut will not now experience the brunt of the storm with the snow turning first to sleet and then rain later this morning.